Are you planning a no spend or save challenge this year? No spend challenges are a useful financial tool. They help you reset overspending (or just spending patterns), they help you save money in general, they reduce waste, and they can help you meet specific savings goals, such as saving for a car or saving for a child’s college education. Money saving challenges help you focus on your savings goals for a month or year. If you stick to a save challenge, at the end you’ll have socked away a significant sum. What are your favorite books to read during a no spend or save challenge? Please leave a note in the comments with your favorite no spend books! 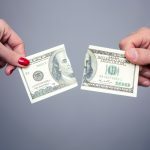 If you’re living paycheck to paycheck, halting your spending for a defined amount of time can help you create enough financial buffer that you no longer worry if you’re laid off or there’s a work shutdown. 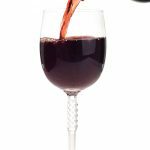 Want some no spend tips if you have no money? Check out Top 6 Tips for a No Spend Money Challenge. If you lack an emergency fund, doing a no spend challenge or money saving challenge will help you start the process of building your efund. Whether your no spend will last a week, a month, or a year, staying motivated is key. 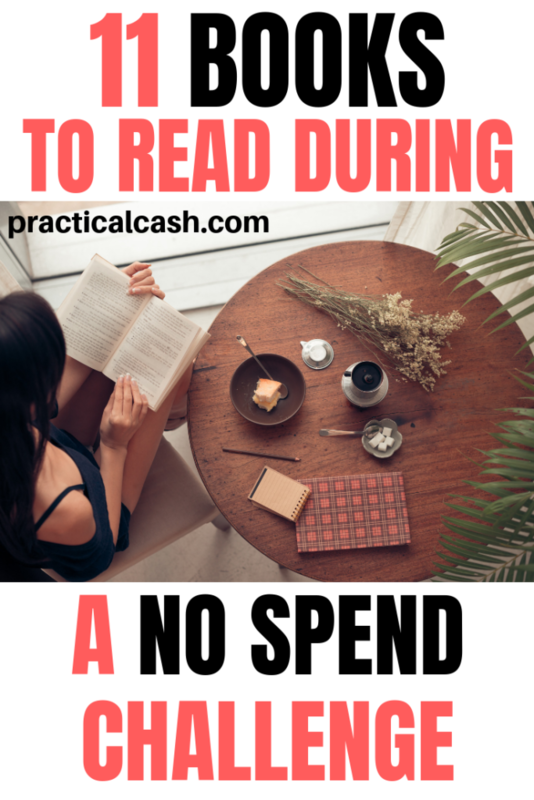 One strategy I use during every no spend or save challenge is to seek out financial reading material to reinforce my goals. Because you’re not out spending money, it’s the perfect time to read up on savings strategies, or learn about something new, like investing. Look for no spend books at your local library. Try a free trial of Kindle Unlimited for a month. A lot of the books mentioned here are included as free in Kindle Unlimited. Just be sure to cancel before you’re charged. For more information about Kindle Unlimited, click here. Try a free trial of Audible for a month. You can find the audiobook versions of many of these books for free. Just be sure to cancel before you’re charged. For more information about Audible and to snag your free trial, click here. Ask friends who are financially savvy if they have any of the books on your list. Find out if any friends use Amazon to purchase Kindle books. They may be able to share them from their Kindle library, giving you access for free. Purchase no spend books secondhand at a bookstore or online at Amazon or Ebay. Use any gift cards you already have to purchase financial books without blowing your budget. The goal of Scott Dannemiller’s year-long no spend challenge was to boost family connection and simplify their lives. His detailed account of a spending freeze is inspiring and helpful to anyone purposefully trying to cut back on spending. Cait Flanders had turned her financial life around and paid off a significant amount of debt – but still found herself drawn into old habits of overspending and mindless spending. Her yearlong quest to live with less is inspiring. 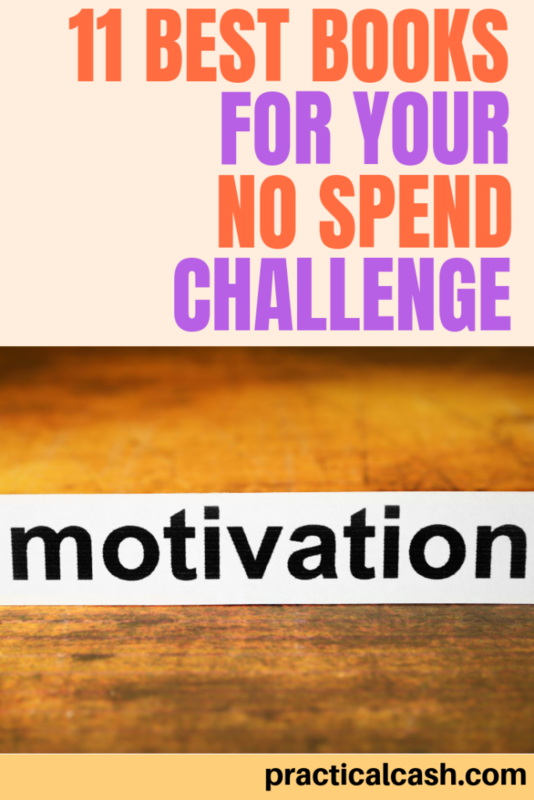 The No Spend Challenge Guide is a great book to read if you want a more practical approach. You’ll learn why a budget isn’t enough to stop spending, how to prepare for a no-spend challenge, and tips for achieving no spend success. Judith Levine, the author of Not Buying It, is one of the first authors to chronicle her journey avoiding extra spending for a year. It’s a few years old, but I loved how the author thought through the structuring of her no spend challenge. Ruth Soukup, author of Living Well and Spending Zero, teaches readers how a “spending freeze” is the solution to reset your financial habits. 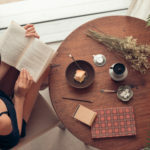 This book offers great inspiration if you’re trying a no-spend challenge and need some practical tips to get through it without losing your mind. 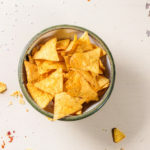 Author Tracey Edwards offers tips and tricks on completing your first spending detox – from how to save money on everyday essentials like groceries to making more money to boost your financial bottom line. If overspending on the food budget is a problem you struggle with, check out A Year Without the Grocery Store during your save challenge. This book can help you learn how to build a stocked pantry while keeping the grocery budget low. I’ve completed a few money saving challenge months. Thinking about how much I already have in terms of resources is a great motivator and reminder. $2.00 a Day offers insight into poverty in the United States and how some families have no choice but to survive. Their lives are a perpetual no-spend challenge, and this book will open your eyes to the abundance most people have around them. If you’re trying a no spend or save challenge because you’re looking for a spiritual reset, this book by Courtney Carver offers insight into the benefits of pursuing minimalism and simplicity. If you’re not spending money for a week or month, you have more time for other life goals. Daily Self-Discipline is an inspiring book that offers exercises and strategies designed to help you develop self-discipline. Marie Kondo wrote this essential guide to clearing clutter, and it’s perfect to read during a money saving challenge. Have you watched the Netflix TV show Tidying Up, featuring Kondo? This book, originally a bestseller in Japan, will help you learn a lot about what you spend money on – and how to make better choices in the future while you clean up your life.